WILLEMSTAD - Last week Curaçao was captivated by the Curaçao Pride. The Queen Emma Bridge graced with her waving rainbow flags and for the first time there was a Pride Walk organized from Punda to Otrobanda. Almost 300 people walked along which rose far above all of the expectations of the organisation. Herewith we send a clear message about how important equal rights are for the people on Curaçao. Now there walked so many people along with the first Pride Walk, we look forward to the Pride walk next year. This year’s Curaçao Pride was officially opened by Minister Eugenne Rhuggenaath from economic development who told a heart-warming and personal story to the public. Furthermore there were different parties during the whole week at the Floris Suite Hotel including the popular White Party with artists as DJ RO1, DJ la Blanche and Dreams. A part of the profit of the White Party goes to the foundation Cura+, which is committed to HIV prevention. Last Sunday the Pride was closed in style with a pool party at Saint Tropez Ocean Club. Unfortunately, hurricane Matthew was the reason that the organisation had to cancel two parties. ‘’It is indeed unfortunate that we had to postpone two parties. Thursday night was just too risky to continue and Saturday we were not given the green light to get into the sea for our annual Navigaytion Sea Parade. Fortunately, our guests reacted very understanding. 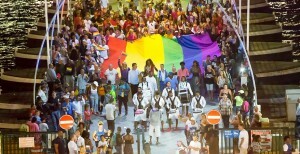 This year there were a lot of people from abroad to participate the Curaçao Pride. Thursday night we organized by the pool bar of the Floris Suite hotel a hurricane party. All of the people named Matthew had drinks on us that night. In this way we tried to give the whole thing a fun twist. For us it could not spoil the fun. It was a very successful fourth Pride with an above average attendance. The upcoming Curaçao Pride will be organized from the 27th of September until the 1st of October 2017. This is also the fifth edition of the Curaçao Pride and so the organisation will celebrate her first anniversary, which is why next year the organisation expects it to be even greater than this year.